Apple tells Foxconn and Pegatron to forget about opening additional production lines for iPhone XR? Most analysts expected the "more affordable" Apple iPhone XR to grab the majority of new iPhone sales once the phone was released on October 26th. That's because of the model's pricing, which starts at $749 for the 64GB version compared to $999 for the comparable iPhone XS unit, and $1,099 for the 64GB iPhone XS Max. While the iPhone XR has the same A12 Bionic SoC under the hood, and carries most of the same features as its more costly siblings, it does not have 3D Touch and it sports a single camera on back. The iPhone XR also is equipped with a 6.1-inch LCD display compared to the 5.8-inch and 6.4-inch AMOLED displays used on the iPhone XS and XS Max, respectively. But something has gone haywire with these analysts forecasts. It appears that the iPhone XR is not selling as well as anticipated. Recently, banking and securities firm JP Morgan told its clients that it now expects the cheaper 2018 iPhone model will account for 39% of new iPhones sold in the second half of 2018, down from a previous forecast of 47%. Longbow Research says that Apple is cutting its orders by 20% to 30% for the iPhone XS Max and iPhone XR. Instead, the company is raising orders for last year's iPhone 8 and iPhone 8 Plus. 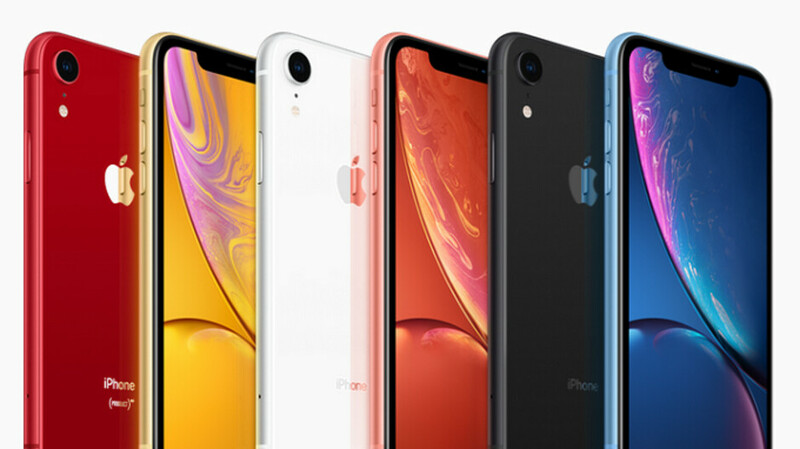 Today, a new report from Digitimes states that two contract manufacturers used by Apple to produce the iPhone XR, Foxconn and Pegatron, have been told by Apple not to add additional assembly lines for the phone. Apparently, both companies had been previously told by Apple to be ready to add new production lines for the iPhone XR. However, those lines are not going to be needed. A further indication that the iPhone XR is not selling as planned comes from top Apple analyst Ming-Chio Kuo from TF International. Kuo, who has an amazing track record, says that he cut his projection of shipments of the iPhone XR during the calendar fourth quarter of 2018 to the calendar third quarter of 2019 from 100 million units to 70 million. The weaker than expected demand for the handset that was expected to be the best selling new iPhone during the holiday shopping season has investors dumping Apple's stock. From a closing price of $215.42 on the October 26th launch date of the iPhone XR, Apple's shares closed Friday at $193.53 for a larger than 10% decline. I told you, no one wants a phone without 3D touch!!! I wouldn't be surprised if >90% never even use it. There are so many features tied to 3D Touch - everyone uses it in some form or another. 3dt Contacts, press favorite - starts a call. Pages/fb/insta, new post. Email/message - instead of opening it, you 3dt, you see what is said and move on (delete it, mark it, forward it etc) Get a video in imessage - instead of opening YouTube you just 3dt. Links - instead of wasting the time to open the page (maybe a new tab so that your work is not affected), switching to it, browse contents, going back to the initial page, you just, yes you guessed it, 3dt. Why do you need to take so many steps that on an Android phone take just one touch? Example, I do not have to press with the right pressure on contacts, then favourites to start a call. I just press the specific contact icon on my home screen, so much easier. I can have my contacts app icon on the home screen and long press to get up options just like in 3D Touch all without the added weight and cost that is necessary to use it. I do not even have my contacts icon on my screen taking up space, I just swipe and everything I need is there. So my home screen not only looks better and less cluttered than an iPhone screen, it is also more informative, efficient and faster to get things done. The same thing applies to emails and a myriad of other tasks. So you see 3D Touch even on an iPhone is not really needed, virtually everything can be done just as efficiently and on Android even more so. My guess is that Apple knows this already and will phase out 3D Touch in a year or so. Why did you felt the need to bring android into the discussion when we were talking about 3Dt on the ios? Android has its share of great features and shortcuts but it's wrong to think about an os, comparing it with another, and the worse mistake is to think at it subjectively. For instance, I have 30 favorite contacts, should I fill one screen with shortcuts when I can have a single icon that I 3Dt; should I fill my screens with widgets when I can 3Dt the app icons? With 3Dt every element on iOS (icon, main window, notification, button etc) has the ability to implement 3 interactions; I can press (short and long) and I can 3Dt (on android I have to wait for the os to know what I want to do, on iOS I just apply more pressure). I use both OSes daily and I can tell you that both do things at their pace, some things are faster on the first and other are faster on the second. I'm not saying it is a must, I'm just saying that on iOS - the way it is designed today - 3Dt brings a new lever of functionality. I'm sure things will change - and when they'll do, I'll be more than happy to embrace the future - but today ios is way better with 3Dt than it is without. I'll just take one aspect of this debate on 3D Touch. First and foremost you can't change the launcher on IOS amongst the numerous restrictions on the user. If you could, you could try FastKey launcher which allows you to press one letter on the on screen mini-keyboard and immediately brings up all your favorite contacts beginning with that letter. Click the contact and it dials it immediately. In other words "there's an app for that" and it's ad-free. The things ios users tend to rave about are readily available and customizable on android and WE have the CHOICE to implement them as we see fit. It's great that Android has all those things, but ios is not android so why brig up fastkey launcher (I already have that option baked in the Spotlight search)? 3Dt is a feature for ios; if others will find it useful, they will use it, if not, they won't, but don't tell me I shouldn't want/need/use it on my iOS phone just because you can and use something else on your phone. I'm not telling you what to use. I'm pointing out that ios users tend to gush over things we take for granted and can implement in multiple ways. Btw Leo you were asking me how android backs up messages/sms in another thread? Well my new NexS does it with Vivo cloud if I decide to enable it. Off topic but I thought you'd like to know. This article is about the production lines of an iPhone and I was just saying how I use 3Dt on an Apple made phone; I did not mentioned Android, I did not say the way I do things is the fastest, the best, the only way, I was just saying how I use that particular feature on an iPhone so please keep Android out of this discussion. I know that Android has a native tool to save the messages into Drive and I have known for years that Samsung and Huawei have their own cloud options where they save the messages; on my first Android (HTC Desire S), before today's cloud options, I was using an app to backup and restore the messages in/from Gmail. I might have asked a different question or your answer serves someone else, but thanks for mentioning it (I really do, I'm not being ironic, condescend or anything else). You mentioned the various uses of 3Dt and it begged an android comparison. I wasn't the first to mention android, I just joined in and for some reason you don't like the comparison. Is that because it's not really as super-duper as you guys make out? Doesn't sound like a big deal to me. Sounds like something that we android users take for granted and is standard across the board. Yeah it was you. You were going on about how fantastic iMessage is and its capabilities. I didn't wanted to go there but you really want me to explain why 3Dt is better than almost any Android has to offer and how it helps me do things faster than on any any other phone (only Note with its Pen is faster, but I still do half the job until one takes out the Pen)? Leo, with all due respect I am certain you haven't used as many different android manufacturers as I have. If you want me to list them I will. Please stop making blanket statements that 3Dt is the greatest thing since sliced bread and Android doesn't offer anything similar. As an aside, your credibility is very much in doubt when you can't distinguish between a DNS resolver and a VPN yet you continuously spout off. I'm pretty confident there are a lot of people that have been using more Androids (heck, more phones all together) than I have. When I need to do a task on Android, I use its tools; when I need to to the same task on iPhone, I use iOS tools. Both sets of tools are fast, work very good, easy to learn and reliable, you happen to like one implementation, I happen to like the other. I'm sure YOU, JMartin22 and many other smartphone users are able to perform those tasks just as well through a dedicated launcher, millions of widgets/shortcuts on the screen, exiting and entering different apps, but FOR ME 3Dt just works way better, because its standardized (there's only one thing to remember: how to apply different pressure) and it's consistent (any iPhone flagship has it). All my IM apps take up just a folder space; when I have an unread IM, I just 3Dt on the folder icon, I can see where it is and, if I want to interact with the sender, I just tap and go to my IM app (it doesn't matter the app, it takes me there) - there-s nothing that Android can offer for that (WA and Messages are the only ones that have long press functionality and only WA has widgets); if I want to quickly start a video, I 3Dt and bam, my video recorder starts - I am yet to find a faster way on Android (no matter what phone I use); when I need to identify a certain video, I just "peak" at each one with 3Dt without the need to open the player, I drop it and go to the next one in a jiffy or I pop it and watch it, if it is the one I wanted (only Samsung Note has something similar); if I want to make a live video or a new post on my social media apps, I just 3Dt (on Android only Twitter allows new tweet on long press, no live however); when I make a markup, the line takes into consideration the pressure I apply and draws the line accordingly. Those are just examples of every day functions that no Android phone - that I know of - do at all, but iOS is filled with 3Dt interactions that, until Apple decides to change the way they are implemented, are very nice to have in this form. I have never said It is a feature one can't live without - I've seen an Android launcher (I don't recall the name) that had swipe on the icons for quick actions; peak can be done through long press (but not pop); pressure sensitivity can be done through the surface covered by the finger (or a Pen) - but it is a feature that for now it's good to have to use (and to abuse - like I do). You know what's the difference between me and a whole lot of people that are being wrong from time to time? I always admit my mistakes (if you will look back, you will see that) and learn from them; they don't. I'm just a anonymous person on the internet that posts points of view, I don't need to have credibility; if you care to read them, agree or disagree, it's ok, if not, it's also ok.
You are correct in saying that if you are used to one mobile OS then there is probably a way to get many things done on both that is adequate for your use. However, you have to accept the due to its closed nature and Apples dictatorial approach Android can do many things that IOS cannot do and of those both can, often Android is more flexible. Before you go off on this one, I agree there are advantages that go with the closed and dictatorial approach. One chooses what one is used to or prefer. You may feel 3DT works better for you, that's fine, but claiming it is better and does many things that you cannot do in Android is incorrect. What I will say is 3DT was one way to introduce functionality that Android users already had and in many cases was/is less efficient than the Android equivalent. Apples way added weight and cost yet bought nothing new to the smartphone marketplace. I could demonstrate this over many uses, but I will take up your IM example. You take two actions to see an IM message - "3Dt on the folder icon" and "tap and go to my IM app". On my phone I can have all the IM apps on the home screen and it will tell me I have a message via a badge. one tap is all that's required to answer. Now you may not want all your IM messages on the home screen, so I have an excellent app called Dupe where there are various way (based on your preference) to do the equivalent of the long press. I just swipe instead of 3DT. I then have all my contacts available and not only all my IM messaging clients but all communication clients too (email, call, text, IM, social for eg.). I then just swipe the contact to the relevant client and I can communicate as I wish. Same number of actions, just many more options. In fact, there is less in the end as you have to choose the person to reply communicate with. So you are wrong to say there is no solution in Android, almost always there is and in many ways a better one. The problem with many iPhone fans is they assume what Apple is giving them is the best solution, so everything else is inferior and they are very vocal about it. 3D Touch is one such example. If you read the comment you replied to, it referred to why 3D Touch is not necessary. I was pointing out that this is correct using Android as an example. Your example on contacts is correct if you want to access lots of contacts frequently. Of course, one solution open to you in Android is a dedicated a page for your favourite contacts, if it is important to you, something you just cannot do on IOS. I have done this in the past but now use an app called Dupe, so with one swipe I not only have access to all my contacts sorted in a way that suits me, but all my communication apps too. So no need to take up any room on the desktop and fewer steps to take an action than 3DT. See comment 75 above. I know how 3D Touch works as I have used it. I can see for IOS users how it could be useful in some cases, it makes up for inadequacies in IOS. The point I am getting at is 3DT does not bring a new level of functionality to mobile phones, the functionality it brings may be new in some cases for IOS users, but that is it. From what I read and from other regular comments if 3DT disappeared it would not make much difference, as it is not widely used. It would be a shame for you as you use it, but it is not the "killer: feature many iFans make it out to be and it justs adds weigh and cost. First of all, iOS is not closed - it is regulated - and Apple is not dictatorial - it makes sure those rules are respected, because that's how iOS got to be as stable and safe as it is today. Second, there are tasks (seeing IM notifications) and there are ways to execute those tasks (notifications, widgets, the app, the icon, 3Dt etc); I know that Android offers more ways to perform a certain task, but you have to be aware that some of them are better (allowing the user to put the icons anywhere) while other are worse (you need to go all the way up to remove an app). This is not a vs. - I never wanted to be and it is of no use to turn it into one - it's not even an objective comparison, because I was only saying how I use 3Dt and how it is better for ME and MY usage - I'm not saying you should like it and I'm not saying my tools are better than your tools. I would like to better use my Android; can you provide a link for that Dupe app, because I can't find its name in my Play Store. Thanks. I assume nothing; I use one, I use the other and I conclude; you do the same and we are both right, that's why many times it's useless to try to objectively compare 2 different mature OSes. The fp scanner was not necessary when we had pin/patterns; face ID is not necessary when we have fp scanners, but they sure make things easier, just like 3Dt makes things easier on iOS. I'm sure Apple is not going to eliminate such a powerful feature unless it figures out a way to implement its functionalities throughout iOS without it and when it does I will not care about it (like I no longer care about the jack, a physical button, flash - btw, do you even remember flash content on the mobile :)? - or probably the fp scanner). IOS is a walled garden have you ever heard that description? It is a bit like a prison. That does have advantages, I would be the first to say it, however, there are also downsides too. Apple is dictatorial, it decides what is best for the user and takes great care to stop anything interfering with that. This approach also has some advantages and downside. Would you deny any of this? You do not have to go to the top of the screen to remove an app, hard press, remove, to remove the icon off the screen (something you cannot do in IOS or long press), to uninstall in the app drawer long press, uninstall, to delete app. "I didn't wanted to go there but you really want me to explain why 3Dt is better than almost any Android has to offer and how it helps me do things faster than on any other phone". Maybe not, but you invite the discussion by stating 3DT is better than almost anything Android has to offer, which is an untrue statement. I am sorry I misspelt the name, Drupe is the name of the app.https://play.google.com/store/apps/details?id=mobi.drupe.app&hl=en. As I have said already 3DT may well make things better on IOS, because it IOS was behind Android in this area. The point I make is you could do the same on Android before 3D touch came out and there was no need to introduce a hardware solution adding weight and cost, when simple software additions does the job just as well. Of course, you will not care about Apple removing a feature you obviously rate highly, you follow what Apple gives you. I do care about the headphone jack, it's still relevant, as do millions of other mobile phone users including iPhone owners. I do not miss a physical home button, I am more than happy with the FPS on the back, so it is good that has gone. Just like it had gone on many Android phones before the iPhone X. Flash, I never missed. What I do like is face recognition on the front and fingerprint on the back, it covers more use situations and is far superior to just one biometric option. Of course like the headphone jack, Apple does not seem capable of designing a phone of reasonable size to accommodate all these features, one reason I like Samsung phones, superior design in that regard. iOS is more like a house with electrified fence than it is a prison: you can exit and enter the premise whenever you want as long as you use the gate (and anyone who tries to jump the gate gets electrocuted). The only thing imposed by Apple is the way an app can access core functionalities of the OS, everything else is absolutely free. "You do not have to go to the top of the screen to remove an app" Have you ever used a phone that isn't Samsung - I'm thinking a Vanilla Android? FOR ME, 3Dt is THE s**t to have; nothing on Android, except Note shortcuts, comes close to the versatility and power of 3Dt + CC + widgets on iOS (and I'm even faster than any Note user, except when he/she already took out the Pen). Yes, one can do things without 3Dt, but they are better, faster, easier, fun to do with. No, dude, I don't care about the features, I only care about what I can do with the whole product. I don't give a flying f**k if I have a fp scanner or a face scanner as long as the feature unlocks my freaking phone, I don't care about lightning or USB-C as long as the port allows me to recharge the phone and to connect it to other devices (today, I don't even care if they decide to remove the port, as long as I have wireless charging and data transfers I can do with the cloud); I don't give a f**k about 4-6-8 or 1000 GB of RAM, 2-4-6-1000 cores, Adeno, kirin, snaps**t, atomic something, as long as I can open 100+ apps (on the iPhone that is, because Android is designed differently) and do stuff with them. And that's why today I use 3Dt everywhere I can but tomorrow I won't give a f**k if I have it or not, if I will also have the option to do the stuff I need, using something else (4Gt, a biometric chip implanted in my but, air gestures, sounds or any other s**t phone producers are going to come up with). Get your heads out of your "Apple hate"-asses and enjoy the tech you can have today; just use your freaking widget and let me use my freaking 3Dt. Apple is a prison, the rules are very strict, so you cannot enter or exit freely, only within the controlled parameters of the prison. As I have said that has some advantages and I am not criticising that per se, but you have to accept it brings significant downsides. I have used various Android phones, on all I can delete an icon on the home screen and uninstall from the app drawer. It is not a feature limited to Samsung phones and can even be done on a phone that comes with vanilla Android. Remember one of the biggest advantages of Android is flexibility. You may find 3DT the best thing since sliced bread, that does not make it superior to the way Android approached the problem. The biggest mistake IOS fans make when claiming it is far better than Android is that they are used to IOS so things seem more difficult on Android. Which is the same when switching the other way. When I switched from a 4s to a Note 2 it was difficult at first but after a week or so that started to go away and within a month there was no way I was going back until IOS improved. IOS was just too slow and cumbersome because Apples "prison" would not let me use my phone in an efficient manner. 3DT is a good example of this. I do not know anything you can do on 3DT that cannot be done on Android. You certainly do not know as you quoted examples that are actually faster to do on Android. I reiterate, it is good you find 3DT to be useful, but that does not mean it is better, faster or more convenient than the Android equivalent. Features and what you can do are the same. If there was no 3DT or face-ID on an iPhone you could not do what these features provided. So you cannot seperate them. You may not need features but if they are useful to others then they are good not bad. I do not hate Apple, last year I bought an iPad Pro, because it was the best product available for what I wanted to use it for. I would buy an iPhone if it could do what I need better than any Android phone for a similar price. The problem is iPhones or should I say IOS are far too limited and slow for me. What I dislike is people like you who are exactly what you accuse others of being. I am not spreading Apple hate, but correcting commentators who make statements that I believe are incorrect and misleading. Just like here where you said - "3Dt is better than almost any Android has to offer and how it helps me do things faster than on any other phone" or "it is impossible for users to see the difference for resolutions over 300ppi". That is what these forums are for and if get upset when you find yourself being challenged or criticised for what you say you should simply stay away. Those that don’t use it, then enjoy the XR - it got the “innovative” long press. Even typing this post I already used to to move the cursor to place quotation marks after I typed the word. Love it. When would you be forced to use it though? I'm asking, cause I've never been in that situation. I use it a lot on my Max, especially to open new tabs in Safari, or to open one from the home screen. I also use it big time, to handle notifications. It's one of my favorite features, and hopefully Apple expands its use instead of getting rid of it. I'm a huge proponent of 3D Touch. I love a lot. It's just 3D touch. It's that cheap crappy 6.1" LCD display that isn't even full HD resolution. Plus that display doesn't support HDR content. For $750 USD and in Canada it's $1030 for the XR. That is just ridiculous. It's at flagship prices, but the XR is clearly not a flagship. That's what the media should be telling everyone. It's not about the 3d touch, it's about the price. Xr is a very niche product since many phones today can do many things below $800.